Much like I am when I watch Game of Thrones, I was captivated with Williams every time she was on screen. She taps into her character like few other actors can, and she breathes life into every thought and action. Honestly, she outclassed almost every other actor in both of her episodes, rivaling only Capaldi’s increasingly-more-enjoyable-to-watch Doctor — which is the second awesome thing on my list. Capaldi has really, really stepped up his game as the Doctor. I don’t know if it’s the better writing, the stronger narratives, or if he’s just more comfortable as the character, but I find myself more and more engaged with his portrayal of the world’s favorite Time Lord. There are some truly stand-out moments in these two episodes, but I think the one part that stuck with me the most was in the The Girl Who Died, when he finally remembered why he chose this particular face. It’s a question that was first brought up in his debut episode. He couldn’t figure out why he chose such an old face, a face that he could have sworn he had seen before. We, as the audience, assumed that his bout of déjà vu was a wink-wink, nudge-nudge move by Moffat, because Capaldi was a guest star on the show back during Tennant’s run as the Doctor. 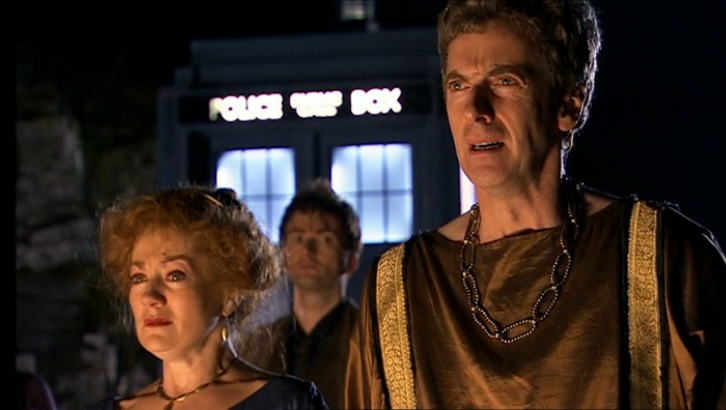 But, in this episode, we all had our collective mind blown as Capaldi’s Doctor had a flash back of Tennant’s Doctor saving Capaldi’s character (Lucius Caecilius) from certain death in The Fires of Pompeii. Back in the day, this was a pivotal moment for the Doctor, because the destruction of Pompeii was a fixed point in time. No matter what he did, Pompeii would always be destroyed, and everyone there would die. But Donna Noble, the Doctor’s old companion, challenged him to break the rules and just save one person, just one person. He ended up saving Caecilius and the man’s whole family, all of whom went on to live meaningful and prosperous lives. Flash-forward to now, where Clara and the Doctor are debating the ethics of breaking the rules of time. He says he isn’t supposed to cause anything greater than ripples in time (no tidal waves), but when he accidentally causes Ashildr’s untimely death, he remembers why he chose his face. He needed to remember that sometimes it’s okay to break the rules of time, that sometimes it’s okay to cause a tidal wave. He uses some alien technology to bring Ashildr back to like, but he ends up granting her immortality in the process. Clara thinks that is a good thing (at least she’s not dead, right?) but the Doctor isn’t so sure. 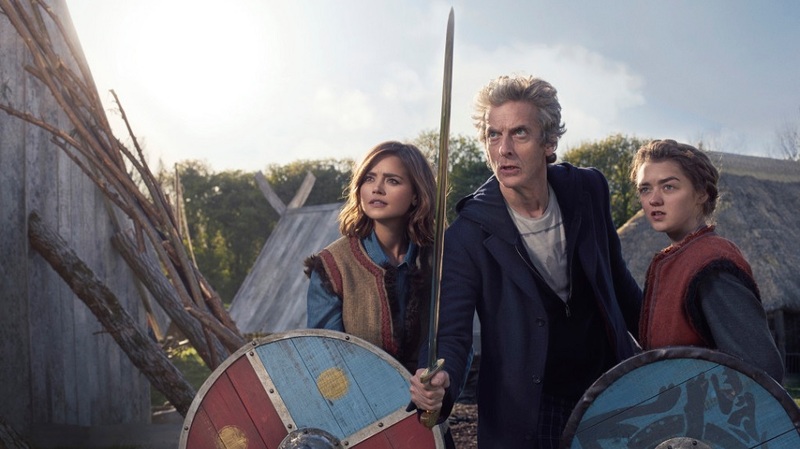 His doubts are made all the more obvious when he meets Ashildr 800 years later in The Woman Who Lived. She’s become a jaded thief who only serves herself because everyone else “disappears like smoke.” She even forgot her original name and started calling herself “Me,” because she is all that matters. It’s a stark contrast to what happened when Tennant’s Doctor saved Caecilius, which makes the Doctor’s decision to break the rules and bring Ashildr back to life that have that much more of an impact. It proves that, despite his best efforts, he doesn’t always win. These are the strongest elements of these two episodes of Doctor Who, because they highlight some of the best features of the show. I love seeing the Doctor wrestle against himself, trying to determine what is morally right or wrong. It shows that he cares about humanity and the people around him, despite his best efforts of trying to stay emotionally detached and bound by the rules of time. That all being said, these two episodes were not without their flaws. Despite my 800+ words of praise, I still felt like these episodes could have been better. The vikings in the first episode were forgettable, and often ridiculous, as were the villains of both episodes. 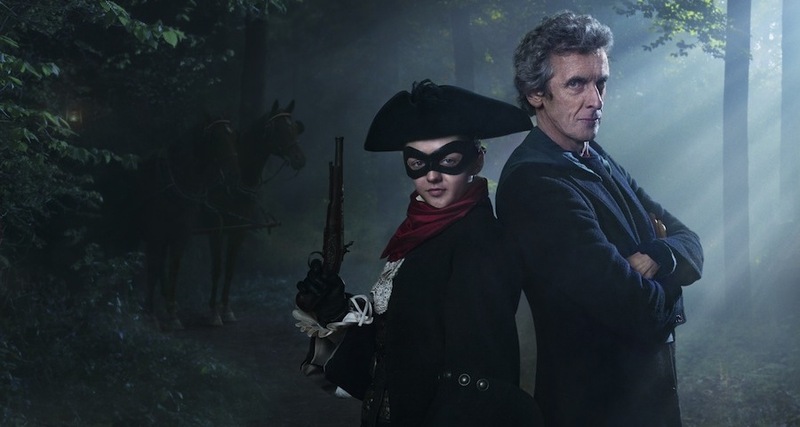 Out of the two, I definitely enjoyed the second episode more because the Doctor and Ashildr were featured front and center (Clara was absent for most of the episode). Their dynamic is both charming and intriguing (he protects the world from aliens, and she protects the world from him) and I can’t wait to see Williams return to the show later in the season. Yes, I enjoyed these episodes, but I don’t want to enjoy them despite their flaws. I want fresh stories and compelling characters! It perplexes me to no end to watch this show struggle to maintain a standard level of quality, and I don’t think it’s ever going to reach a level of consistency as long as Moffat is running the show. Clara is a character that I still don’t have any real attachment to, but I find myself growing more and more anxious every time the show alludes to her leaving later this season. What’s going to happen to her?! The Captain Jack Harkness reference was a nice nod to longtime fans. The Doctor strumming on his electric guitar will never get old!